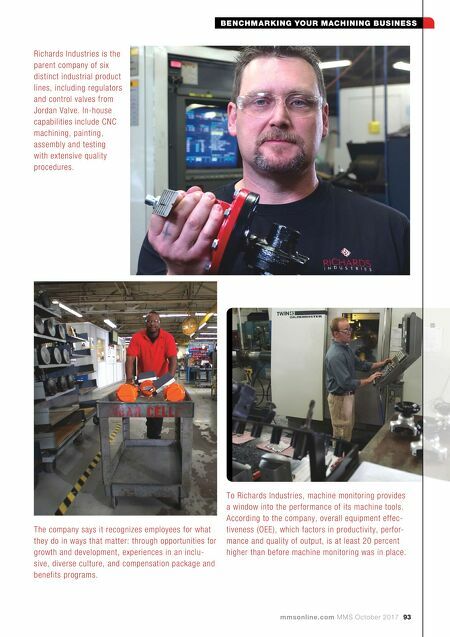 92 MMS October 2017 mmsonline.com BENCHMARKING YOUR MACHINING BUSINESS END MARKETS SERVED WEBSITE richardsind.com COMPANY DESCRIPTION WORKPIECE MATERIALS COMMONLY MACHINED Richards Industries 3170 Wasson Road Cincinnati, Ohio 45209 Phone: 513-533-5600 richardsind.com • Oil and gas • Power generation • Pumps and valves • Brass • Bronze • Cast iron • CFRP • Copper • High-temp alloys • Steel alloys • Titanium Richards Industries is this year's Top Shops Honors Program winner in the shopfloor practices category. This Cincinnati, Ohio, industrial valve manufacturer has taken extensive strides to implement lean strategies to improve flow and throughput in its more than 100,000-square-foot facility. In some cases, it has moved away from multitasking-type equipment to create lean, multiple-machine cells to achieve higher production. 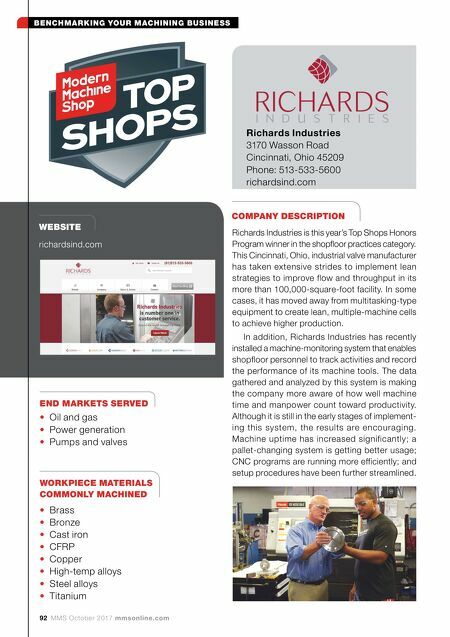 In addition, Richards Industries has recently installed a machine-monitoring system that enables shopfloor personnel to track activities and record the performance of its machine tools. The data gathered and analyzed by this system is making the company more aware of how well machine time and manpower count toward productivity. Although it is still in the early stages of implement- ing this system, the results are encouraging. Machine uptime has increased significantly; a pallet-changing system is getting better usage; CNC programs are running more efficiently; and setup procedures have been further streamlined.